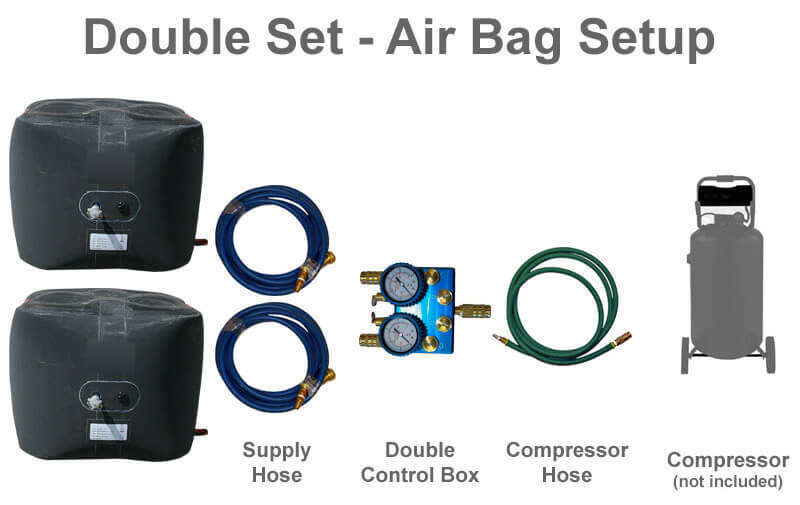 How It Works: Use compressed air from a portable air tank or air compressor to blow up the inflatable bag like a balloon, in turn raising heavy loads sitting on top. Medium Pressure Lifting Cushions require only 1-3 inches clearance for insertion with the main advantage over low pressure cushions being they provide heavier tonnage lifting capacities for similar size low pressure cushions while requiring less work area and taking up less storage space. The Medium Pressure Lifting Bags work best in cantilever or "hinged" style lifts, but can also be used for vertical lifting if rigged correctly so lateral movement of the weight being lifted is restricted. The inflatable air bags work on volume rather than pressure to create the lift, working at 15 psi / 1 bar of pressure and can lift as much as 35,000 lbs./ 15,900 kgs. up to 40”/ 1000mm, which is the major difference between low and medium pressure cushions. Both provide more height than high pressure for accessibility with the medium pressure lifting providing more weight capacity than low pressure due to the higher operating pressure. These medium pressure inflatable jacks unlike the high pressure air lifting bags, lift the weight they are rated for the full height of the cushion. 2 year warranty, but with normal care and maintenance, they should work well over 20 years trouble free. CE certified.